The ’80s are, indeed, making a comeback. While popular culture sees the resurgence of shoulder pads, My Little Pony, and Ghostbusters, the state legislature is experiencing its own blast from the past. House Bill 16-1077, recently signed into law by Governor Hickenlooper, revives the Statutory Revision Committee (SRC), an entity repealed in 1985. Creation and composition. 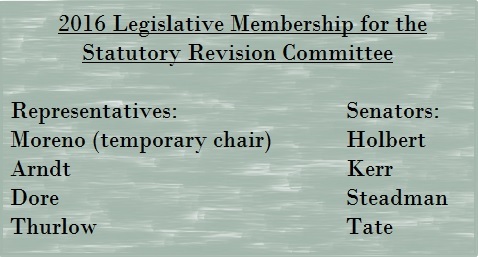 The SRC, created in part 9 of article 3 of title 2, Colorado Revised Statutes, consists of 10 members: Eight legislators (two each appointed by the Speaker and the Minority Leader of the House of Representatives and by the President and the Minority Leader of the Senate); and two nonvoting attorneys appointed by the Committee on Legal Services. The legislators currently appointed to the SRC are Representatives Moreno (temporary chair), Arndt, Dore, and Thurlow and Senators Holbert, Kerr, Steadman, and Tate. The Committee on Legal Services is expected to appoint the nonvoting members at its September 29, 2016, meeting. Report its findings and recommendations on or before November 15 of each year to the legislature. Legislation and limitations. The SRC may recommend bills by a majority vote. Although there is no limit on the number of bills that the SRC may propose annually, and such bills do not count against an SRC sponsor’s 5-bill limit, there are a few constraints on the legislation the committee may introduce. First, the SRC may not consider matters that are currently pending or appealable before any court. And the SRC must “propose legislation only to streamline, reduce, or repeal provisions of the Colorado Revised Statutes” and “endeavor to recommend legislation that cumulatively has, in each legislative session, no net increase in the number of laws or pages of laws.” This directive did not exist in the statutes that created the former SRC. While the SRC must adhere to these mandates, it is not limited to any particular substantive areas of law when considering legislation. The former SRC typically examined a wide array of topics for potential legislation. In 1985, for example, the SRC received 80 bill ideas from various sources and ultimately sponsored 12 bills. The bills’ subjects ranged from curing internal inconsistencies within the “Uniform Commercial Code” to restoring the ability of judicial clerks to collect a certain filing fee (which authority had been inadvertently deleted from the Colorado Revised Statutes) to removing mention of gender in certain correctional facility names to reflect that the facilities were not limited to any particular gender. First meeting. The SRC is conducting its first public meeting, at 9 a.m. on Wednesday, August 17, 2016, in House Committee Room 0112 at the state Capitol. When available, the agenda and minutes, for this and future meetings, will be posted here and the live and archived broadcast of meetings can be accessed here. Submissions and suggestions? Finally, to fulfill its statutory charges, the SRC will rely on its ongoing dialogue with the legal community and the public. To notify the SRC of possible defects or anachronisms in the law or possible antiquated, redundant, or contradictory law, please send an email to SRC staff at StatutoryRevision.ga@state.co.us. Previous Post: What Do White Teeth Have to Do with Federal Preemption?